whether you remember or not. Click ADD TO CART now to train good posture & exude more confidence today. To banish bad posture forever, also follow these posture tips when not wearing your back brace. ✅ Most importantly, awareness of posture as often as possible. ✅ Avoid uneven positions like unevenly crossed legs or tilting head. ✅ Alternate sitting at the front of chair, & leaning straight against back rest. ✅ Keep your spine, neck, & head all vertically aligned when standing or sitting. ✅ Stretch and move often to avoid slouching after muscle fatigue, 2 mins every 30 mins. CAN I WEAR UNDER CLOTHES? underneath. The moisture wicking properties helps prevent sweatiness. DOES IT DIG INTO ARMPITS? neoprene should be adjusted just tight enough to not stretch the material, giving more freedom of movement. 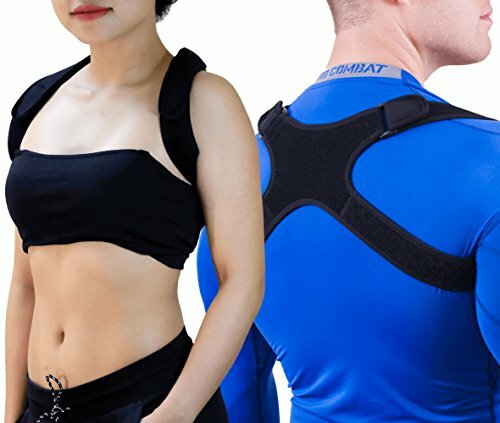 Add to Cart now to train good posture & exude more confidence today. ✅ RISK FREE if something breaks we'll take full responsibility. The risk is on US when you can get a refund, no need to return anything, NO QUESTION ASKED. Simply buying from us automatically enrolls you in our Customer Coverage Program! ✅ TRAIN WHILE WORKING corrects posture while working, exercising, & commuting. Train your posturing & soon you won't even need the brace, even with 1 or 2 hours per day. ✅ EXUDE CONFIDENCE with a naturally dominant posture. Humans subconsciously recognize an upright, chest out posture as a sign of confidence. It's a trainable position. ✅ WICKS AWAY SWEAT so you won't overheat from exercise or hot days. The thin & light but strong Neoprene can be worn under clothes without issue. ✅ FREEDOM OF MOVEMENT with elastic stretch allowing exercise while bracing strong. Adjust the Velcro straps to a comfortable pressure that leaves a bit of stretch room. If you have any questions about this product by GAVIMAX, contact us by completing and submitting the form below. If you are looking for a specif part number, please include it with your message.